Dare Devil's Pizzeria has proudly served the Outer Banks since 1987. Our family-owned Outer Banks pizza restaurant has distinguished itself on the local food scene with its pizza and strombolis, all made with our signature dough and sauces, all made fresh, in house daily. You can create your own or choose from one of our specialty creations, like our Crazy Greek pizza – a locals’ favorite – or the Three Amigos, baked with chili, cheese and onions into the pizza. Don’t forget to ask us about our daily specials too. Not in the mood for pizza or stromboli? No problem. At Dare Devil's Pizzeria, we also offer fresh salads, hot and cold sub sandwiches, lasagna, and appetizers. Pair your meal with a refreshing beverage too. We carry Coke products, beer and wine. Our full bar can also concoct an assortment of cocktails and shooters for you. Call in an order for carry-out or enjoy it surrounded by the friendly faces in our restaurant. Our place has an inviting, laid-back atmosphere. Sit at the bar and catch the games on TV, and come in with your crew and gather around our long tables. After all, few things bring people together like the classic custom of sharing a pizza. 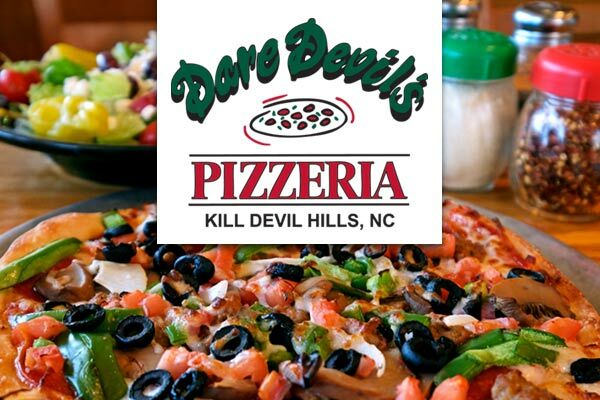 Please visit our Outer Banks pizza restaurant in Kill Devil Hills, NC. We look forward to seeing you! 7 Days - Open 4:30 p.m.